Yesterday I met my friend Audrea for lunch at AQ Cafe, inside the Scandinavia House, which itself is nestled amongst the consulates along Park Avenue below Grand Central Station. As you can guess, the menu is Scandinavian, and headlined by Swedish meatballs. They are served in a creamy sauce, with a side of mashed potatoes, pickled cucumbers, and lingonberry sauce (a lot like cranberry sauce). We tried those, along with a salmon platter that included smoked salmon, gravlax, cold potatoes, sour cream, and something that tasted like sweet and sour sauce. Both were okay, but the part of the meal that I just can’t stop thinking about was the Tomato and Cheese soup Audrea ordered ($5). Instead of using spoons, we ripped pieces off the stack of hearty yet soft whole grain bread, thin crispbread and homemade crackers; dunked them in the soup; and took bites while we talked about funerals, pigging-out in Japan, catcalling/harassment of women on the streets of New York, and recycling etiquette. 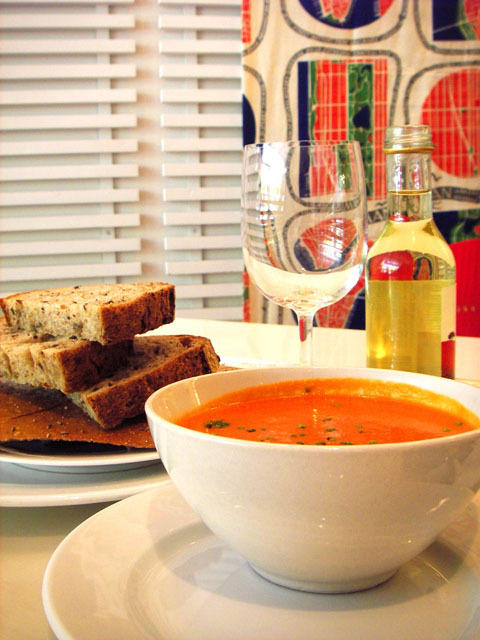 The soup was made with gouda, and since we were dipping instead of sipping, it reminded me of fondue…a lusciously tomato-y fondue. I will definitely go back again for this, order the bigger bowl (seen above is the cup-sized portion) and a double-tall stack of bread. At least once a week a new muffin gets invented in my kitchen, and that keeps things interesting. The one I invented tonight is noteworthy not only for its culinary appeal, but because baking them made my whole house smell freakin’ amazing! Like, getting-dizzy-from-hyperventilating-good. BUT tonight was an exception. 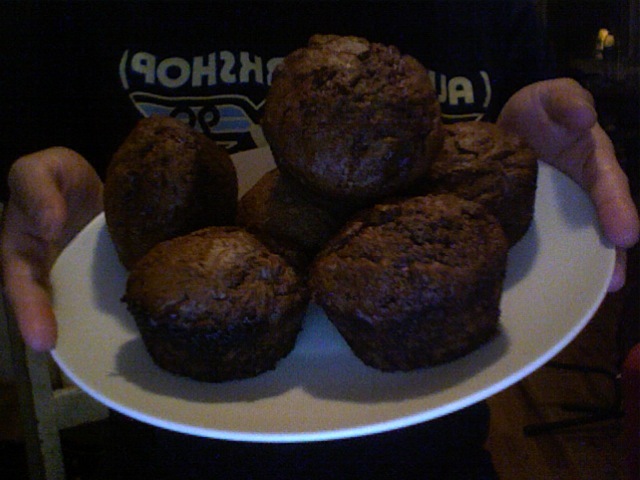 For the first time, I made Vegan Chocolate Raspberry Swirl Muffins. And my house has never smelled better. As far as I can remember, nothing has smelled better. Seriously…better than all the Nag Champa I burned in college, a field of lily-of-the-valley, and every hot dog cart in New York all put together. Preheat oven to 375°F. Grease muffin tin. In a large bowl, combine the flour, cocoa, baking soda, salt, and cinnamon. In a separate bowl, whisk together everything else but the jam. Add the wet to the dry and fold together until just combined. Drop the jam on top of the batter in spoonfuls, and then fold in 2-3 times, but do not completely mix in. Divide batter between tins and bake 20-25 minutes or until a tester comes out clean. You kitchen will smell amazing!